Join our community in solidarity with Pittsburgh this Shabbat. In light of recent events in Pittsburgh, CJP has made the difficult decision to postpone The Search event featuring Christian Picciolini originally scheduled for this Sunday, November 4. We are working on arrangements to host Christian at a later date. This Shabbat is an opportunity for the community to come together to heal. CJP is partnering with the Jewish Federation of North America, JCRC, the Massachusetts Board of Rabbis, the Synagogue Council of Massachusetts, and partner congregations to take part in Solidarity Shabbat, this Friday and Saturday, November 2-3. More details can be found here. We are excited to announce we are now accepting applications for Round I of CJP’s Young Adult Community Grants! This is an opportunity for a 501c(3) or someone with a fiscal sponsor to receive funding for programs that foster innovation and financially support young adults in Greater Boston. Applications will be accepted until Wednesday, November 28. As always, we are here to help you along the way — please feel free to reach out to Karen with any questions or for advice. Do you have thoughts or ideas about our Jewish community and haven’t had a chance to share them? CJP’s new President and CEO, Rabbi Marc Baker, is ready to listen. Marc is embarking on a community-wide conversation tour, “The 360Five: One Year, Five Questions, Many Voices,” and is excited to meet the community. Choose one of six Greater Boston area locations, which take place from November to February, and join this important conversation! Join Young Women’s Philanthropy on Tuesday, November 13 for a hands-on evening of community service! We will be sorting clothing for the JFS of Metrowest's Clothing Closet so bring your donations and make an impact on your community. For more info, contact Dani. Join all of your healthcare friends at the Royal Sonesta Boston on Sunday, December 2 for the Health Professions Annual Breakfast. We'll honor Harris A. Berman, M.D., FACP, and hear from our keynote speaker, The Honorable David J. Shulkin, M.D., who will discuss "Innovating in Healthcare: Lessons from D.C." We are also offering a special post-reception for young adults to mingle and get to know each other. Contact Jeremy for information about the post-reception. Registration is still open for two winter Birthright Israel trips: one for 22-26 year olds, and a new one for 27-32 year olds! Journey from snowy Boston to sunny Israel, eat good food, learn about Israel, and make new friends. Slots are filling up, so be sure to start your application! For more info, contact Karen. Save the date for Chai in the Hub at the Royal Sonesta Boston Hotel on Saturday, February 9, 2019. There will be schmoozing, munching, and great company. Plus, you don't want to miss our speaker. We're keeping it a surprise for now, but here's our hint: The speaker is a recipient of six Ophir Awards (the Israeli equivalent of the Emmy's). Celebrate our Chai in the Hub honorees and put on your dancing shoes. Mark those calendars and we'll see you there! Contact Jeremy with any questions. Each year, CJP helps support programs and organizations throughout our community. Here are some of this month’s events we proudly support. Hear two very smart individuals discuss a complex historical issue. Join the JCRC at Temple Beth Zion in Brookline for a free event on Sunday, November 4, featuring author Yossi Klein Halevi, Senior Fellow at the Shalom Hartman Institute, and activist Walid Issa, Executive Director of The American Palestinian Hope Project. Yossi and Walid will talk about Israeli and Palestinian narratives and shared connection to the land. A Q&A will follow. Email Carol to register. All-you-can-eat chicken soup made by Boston’s favorite chefs. Need we say more? JArts is putting on a delicious, kosher “Chicken Souper Bowl,” featuring ten soups and a variety of tasty options on Sunday, November 4. Get your tickets and come hungry! It’s fun to go to breweries and sample their beers… but it's even more fun to make your own. Want to try it? Now is your chance! The Boston Synagogue is putting on a beer brewing event on Sunday, November 4. Make new friends while learning how to brew different beers. Light refreshments will be served. The first event for the free fall series of Yachad Young Adult (YAYA) Social Group, for ages 16-25, is coming up on Wednesday, November 7 at New England Yachad! Each month they will host exciting activities in a fun, inclusive environment. Hang out with your friends, meet new people, and enjoy activities like game shows, scavenger hunts, art projects, and more. Healthy dinner will be served. Walk-ins are welcome. The knish king of Boston, Steven Peljovich from Michael’s Deli in Brookline, is coming to teach young professionals how to make the king of Jewish dumplings—the knish. Don’t miss this special event organized by Vilna Shul at the Cambridge Community Center on Wednesday, November 7. Walk away proud with handmade, delicious, warm knishes made by none other than yourself! The event includes a sampling of knishes as well as the workshop. There are only 25 spots, so register now! Never done Eser before and want to give it a try? Dying to revisit a past year’s theme? Explore the best of Eser while you’re BASEd in Boston! Join this six-session class, facilitated by Rabbi Elizabeth Bonney-Cohen (EBC) and explore past favorites and new discoveries. In conjunction with BASEHillel Boston, you’ll discuss topics ranging from tattoos to interfaith relationships to life’s big questions in EBC’s very own living room in Brookline. Don’t miss the first session on Wednesday, November 7. Please email Sara for scholarship information. Boston Jewish Film Festival (BJFF) is hosting two great events this month! Head to the Somerville Theatre on Thursday, November 8 for BJFF’s Annual FreshFlix Short Film Competition. See the films, attend a filmmaker Q+A, and join the post-screening party. You also don’t want to miss the TLV TV Binge Day, featuring hours of different shows and episodes on Sunday, November 18, at Brattle Theatre in Cambridge. Register for the fun and click attending on Facebook. We heard there was a secret chord? We all know the song "Hallelujah." But do we know the man behind the song? Brandeis University is bringing in “The Power of Music,” a special exhibit about Leonard Bernstein organized by the National Museum of American Jewish History in Philadelphia. The exhibition explores Bernstein's Jewish roots and social activism alongside his musical achievements. This exhibit is free, open to the public, and runs now through Sunday, November 18. Join ADL New England on Saturday, December 1 at City Winery as they honor Shira Furman, Debbie Grossman, and Mike Harris for their extraordinary leadership and dedication at their 16th Annual Young Leadership Celebration. Get your tickets now for a night full of dancing, socializing, raffles, and silent auctions. You can even catch an "early bird" discount if you register before the end of tomorrow, Friday! The 2018 LimmudBoston Festival of All Things Jewish will draw from throughout New England on December 2 at Temple Reyim in Newton. Classes, music, and workshops of all kinds will fill the day. Discounted registration is available for volunteers. Starting to think about Hanukkah gifts for the cooks in your life? 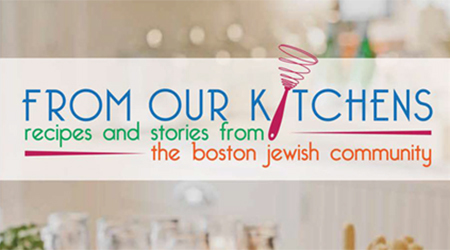 Grab some copies of the new Women's Philanthropy cookbook “From Our Kitchens: Recipes and Stories from the Boston Jewish Community” – and be done with your shopping! The beautiful hardcover cookbook is filled with bright color photos highlighting the Boston Jewish community’s most beloved recipes. Best of all – we’ll do the hard work and ship the cookbook to any address you’d like! Order your cookbooks at cjp.org/cookbook! Questions? Email Judith. The days are getting shorter and we fall back an hour this Sunday. Here’s when to light your Shabbat candles to keep the lights bright. Questions? Ideas? Let’s chat! Reply to this email or reach out to Carissa, Young Adult Initiative Assistant.